This is Dave DeWitt’s recipe for a traditional Mexican sausage that’s often served with huevos rancheros for breakfast. Unlike other sausages, it is not usually stuffed into casings but served crumbled or formed into patties. 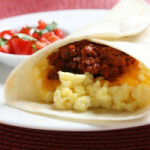 (There are two varieties of chorizo: this Mexican version that is made with fresh pork, and Spanish chorizo, made with smoked pork.) This recipe requires advance preparation. In a food processor or blender, combine the non-pork ingredients and mix thoroughly. Knead this mixture into the pork until it is thoroughly mixed. Cover and refrigerate for at least a day. At this point the chorizo may be frozen for up to 3 months or cooked. To cook, crumble the chorizo in a skillet and fry. Drain before serving.